Mystic Seaport Wedding Photography is most notable for the gorgeous scenery that the seaport provides. Mystic Seaport is America’s leading maritime museum The museum was founded in 1929 to gather and preserve the rapidly disappearing artifacts of the nation’s seafaring past. The grounds of Mystic Seaport now cover 19 acres and include a recreated 19th-century coastal village, a working shipyard, formal exhibit halls, and over 500 historic watercraft. Coastal pictures featuring these boats and the view of the waterfront are common in Mystic Seaport Wedding Photography; however, it is still important to capture the intimate moments shared by couples that may not include the scenery of the location. This image of the bride and groom dancing at a Mystic Seaport Wedding is one such picture. 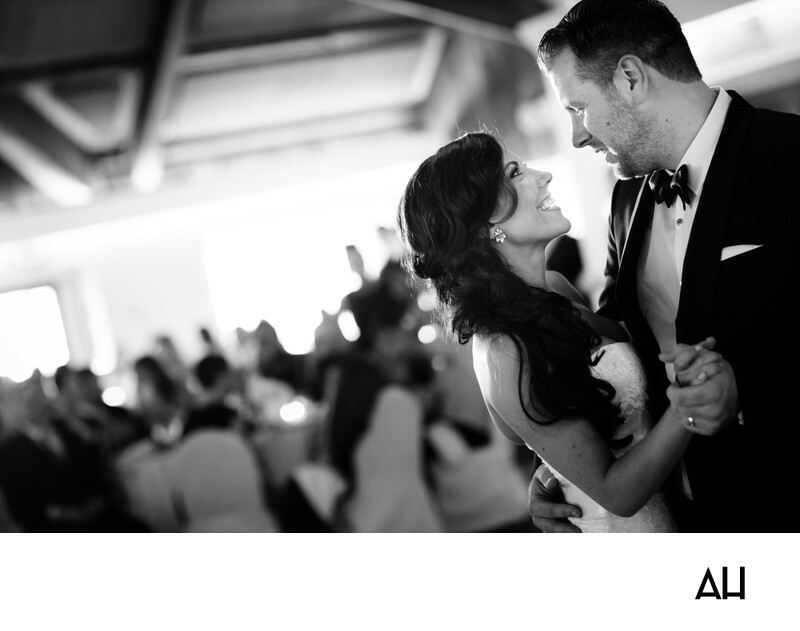 The photo was taken during the couple’s first dance as newlyweds. The black and white coloring of the image ensures that the decorations and guests that surround the bride and groom do not take attention away from this portrait of the two. They are the focus of the picture, and ultimately the day. In the image, the bride smiles up at her husband, love painted across her face. Her expression is luminous and her eyes light up even more as the groom sings the words of their song to her. The groom’s eyes crinkle as he serenades his bride and they sway to the beat of the music that vibrates throughout the ballroom. It is as though the newlyweds are the only two people in the world, dancing to a song that plays just for them.